The Grampian Mountains or Grampians  are one of the three major mountain ranges in Scotland, occupying a considerable portion of the Scottish Highlands in northeast Scotland. They occupy almost half the land-area of Scotland. The Grampians extend southwest to northeast between the Highland Boundary Fault (south) and the Great Glen (north). This includes the Cairngorms and the Lochaber hills. The range includes Ben Nevis (the highest point in the British Isles at 1,344 metres above sea level) and Ben Macdui (the second highest at 1,309 metres). The mountains are composed of granite, and metamorphic rocks such as gneiss, marble, schists and quartzite. 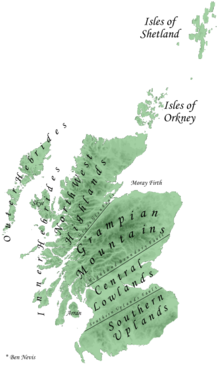 The other major mountain ranges in Scotland are the Northwest Highlands and the Southern Uplands. This page was last changed on 22 March 2014, at 02:50.